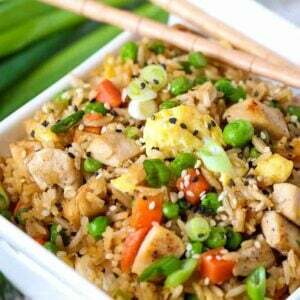 This easy chicken fried rice recipe is sure to be a hit at your house for dinner! Heat 1 tablespoon of the oil in a wok or a large skillet over medium high heat. Add the eggs and scramble, then remove from the pan to a plate. Season the chicken with the salt, pepper and garlic powder, then add the other tablespoon of oil oil to the wok. Cook the chicken for 4-5 minutes until cooked through. Let the chicken sit for a minute in the wok before you start stirring it around so that it sears on the outside. Add the rice to the wok along with the soy sauce, sesame oil, scallions, peas, carrots and the scrambled eggs. Stir to combine and heat the ingredients, taste for seasonings and serve.